Sports Development Studio's computer baseball simulation game, Pennant Fever Baseball is designed to challenge your mind. If you ever wanted to be a GM and a manager of your own baseball team, this is your chance. 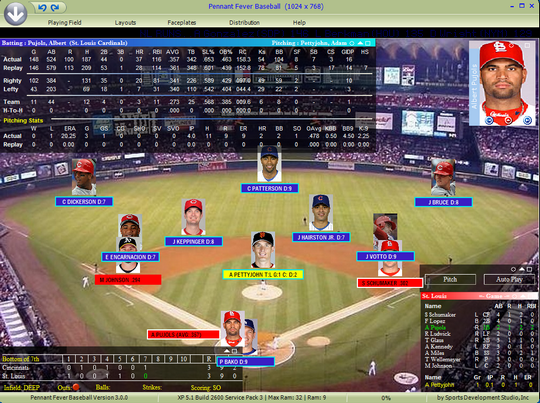 Pennant Fever Baseball has several options for game simulations: Non-Scheduled Single game, Series play, 3-4-5-7 game choice, and complete season replays. Pennant Fever Baseball is unique in that it tracks and stores every single play during Season Replays. Unique features such as Head-to-Head stats are available for every match-up that occurs during the replay. All stats for League, Team, Player, Game, to individual at bats are available at your finger tips or just a mouse click away.You decide how and which way you want to play. 2013-04-25 1.0 Never expires. Fully functional. Try before buy. Not required to purchase. Checkout our other free baseball products or services.